The CON-tender Spirit Lives On! Once again television reality show The Contender showed a lack of class and just how Hollywood has dictated the way this show has been presented. The television showed was plagued by stretching of the rules and deceiving the public. The Contender Rematch show was filled with even more controversy than the reality show. Three out of three fights left a bad taste in the mouth and leaves thoughts about whether blending two of the dirtiest industries together is a good idea. The main event showed just how bad a decision can be. Peter Manfredo finally lived up to hype given to him on the reality series to be blessed with a terrible hometown decision loss. Not that Manfredo looked like a world beater by any means. 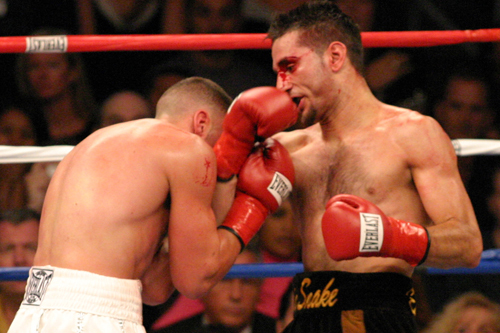 However, compared to the effort put out by Sergio Mora, Manfredo displayed hunger and improved skill. Mora better hold onto whatever portion of the million dollar purse he won on the show because it will probably be the only million dollars he ever earns in the ring. Mora looked clumsy and confused as he was thoroughly outboxed. While Mora had a few moments in the fight, Manfredo showed he raised his game and added new dimensions to his abilities. Give Freddie Roach credit for his work on making Manfredo a better, more rounded fighter. In the end the sportsmanship and skill displayed by Mora were terrible and a major discredit to boxing. Mora proved only one thing in the ring: that he is nowhere near being a legit contender and if he fought a legit contender, he wouldn’t last. Manfredo did show versatility and that he still is a good prospect for the future. 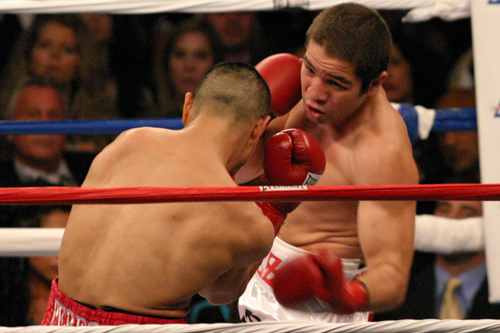 In the first fight, Alfonzo Gomez knocked out Feliciano Ortiz in the fourth round. It should be better said that the referee stopped the fight after spending the third and fourth rounds looking in close for a moment where Ortiz didn’t fight back so he could step in. Gomez looked very impressive and may have knock Ortiz out eventually without looking premature. Nonetheless, the way the referee acted should be noted. Hopefully Gomez continues to look good in his fights as he continues to show that he is the shining star of the show. Following the Gomez fight Anthony Bonsante dropped a very controversial decision to Jesse Brinkley. Brinkley continued to prove that he is the hungriest fighter to be on the show. Unfortunately that hunger is for the food from his girlfriend’s café and not victory in the ring. To give Jesse the benefit of the doubt, he is used to fighting longer fights. In this case he would just be getting warmed up when the fight is over. An aspect several of the fighters on the show had to adapt to. Bonsante deserved the victory as he boxed well and had the better punchstat numbers. The horrendous decision means we have not seen the last of these two fighting in the ring. Next time, perhaps the sound effects and slowed up clips of punches landed will be a more entertaining way to display the fights these two produce against each other. There was a positive in the air tonight though. The show had better commentating than Sugar Ray Leonard and Sly Stallone. So perhaps they are listening to the fans voice. Hopefully the next season of The Contender is not plagued with controversy like the first season. With ESPN being involved, maybe there will be more professionalism and legitimacy. Nonetheless, if tonight is any example of how the new season will go, you can bet that the spirit of The Con-tender will live on.